When We Fall Asleep, Where Do We Go? 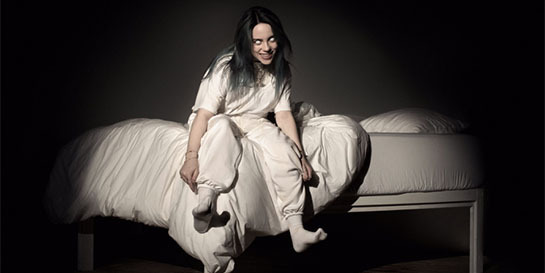 follows on from the success of Billie’s 2017 EP Don’t Smile At Me, which climbed album charts on both sides of the Atlantic. The new album is a cohesive record formed of very different-sounding songs like, Billie says, a group of independently-minded friends. The 17-year-old Los Angeles native has been on one of the quickest ascensions to stardom the pop world has seen. She has sold out tours around the globe - from LA to Tokyo, Singapore to Milan - has millions of Instagram followers and racked up more than 2.8bn Spotify streams. She was the second-most-streamed female artist globally in January and February and continues to stretch pop’s boundaries with her heartfelt songs written with elder brother Finneas. Beats 1’s Zane Lowe picked Billie’s track Lovely as his World Record in April 2018, opening the floodgates to a wealth of support which since has included Beats 1 premieres, music video reveals, and another World Record for her single Come Out And Play – which was itself commissioned by Apple for a commercial last year. Billie’s world tour kicks off in Australia and New Zealand in the spring before she returns home to North America in the Summer. The European dates start in August in Netherlands, during the tour she stops off in the UK for Reading and Leeds festival.